The Libertine Tidbit #30: Scene 1 ~ Coffee! From about the mid-1600s through the mid-1700s, men (and just about all pictures from the period show only men in coffeehouses) drank their coffee in London’s coffeehouses while they transacted business, discussed politics, and shared literary works in progress. 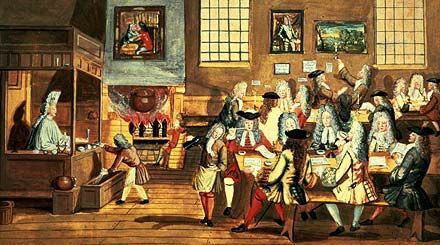 By 1700, there were probably over 2000 coffeehouses in London, or one for every 300 inhabitants. Even though London’s first coffeehouse did not open until 1652, less than 10 years later, coffeehouses had become the favored social venue for members of the Restoration elite. Coffee houses, along with the theater, became an integral part of Restoration London’s social scene. When in 1667 King Charles II’s celebrated mistress, Nell Gwyn, appeared in a comedy entitled The Coffee-house, the performance sold out. "a Drink termed Coffee, which was heretofore in use amongst Arabians, and Egyptians, and which is now a dayes in very great request among the English... it shall be rosted; after which having beaten it unto very fine powder, you may make use thereof, in an equal proportion according to the number of the people that will drink it: Viz. the third part of a spoonful for each person, and putting a little Sugar thereto: and after having it boil a small time, you must pour it into little dishes of porcelain or any other sort, and so let it be drunk by little and little, as hot as it can possibly be endured..."
Coffehouses were usually associated with a particular interest such as science, politics, business or literature. Men of similar interest gathered at particular spots to discuss the latest news and exchange ideas. The most famous was Will's, at the northern corner of Russell Street and Bow Street. It became known as a meeting place of wits and poets; while most of the customers were seated in groups at small tables, John Dryden had a special place of honour, next to the fire in winter and on the balcony overlooking the street in summer. Everyone wanted to sit as close to Dryden as possible - to speak to him was considered a privilege. Picture the Earl of Rochester and the Wits, pouring over the latest literary offering at Will’s coffeehouse, looking for the “good bits and bad bits” and lampooning the latest work from Dryden. Pour a cup (or a dish) of coffee and enjoy! Last edited by DeppInTheHeartOfTexas on Thu Dec 15, 2005 10:38 pm, edited 1 time in total. 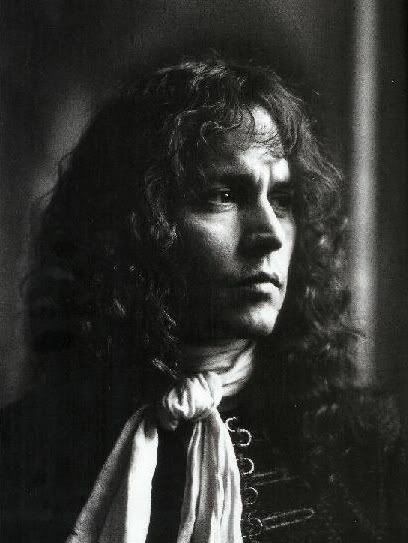 Re: The Libertine Tidbit #30: Scene 1 ~ Coffee! That was marvelous, as all the tidbits have been, but when you post Johnny pics, I have a difficult time (read: impossible) reading the serious text. (I'm okay with the coffeeshop pic at the top, d'uh.) Mmmm, must drool a bit more . . . This gets me so excited! I can hardly wait! Thou shalt not commit adulthood! Johnny, what's your favorite word? fansmom wrote: That was marvelous, as all the tidbits have been, but when you post Johnny pics, I have a difficult time (read: impossible) reading the serious text. (I'm okay with the coffeeshop pic at the top, d'uh.) Mmmm, must drool a bit more . . .
Glad you have enjoyed them. I try to put the Johnny pics at the end so you can concentrate then drool! askmewhy wrote: This gets me so excited! I can hardly wait! I can't wait to get started either! I think this will be a fun discussion. Now if we would only hear about the movie release! Thanks to our fabulous moderators for all their hard work on the tid bits. I found the Libertine very difficult reading the first time through, but after studying the tidbits and trying to struggle through the Debt to Pleasure, I have found the second reading of the play much easier. In fact, I am on the last scene now and I don't even remember reading it the first time! Seeing how wonderful the tidbits have been, I can't wait to see what is in store for the actual discussion! this is going to be wonderful! nebraska wrote: Thanks to our fabulous moderators for all their hard work on the tid bits. I found the Libertine very difficult reading the first time through, but after studying the tidbits and trying to struggle through the Debt to Pleasure, I have found the second reading of the play much easier. In fact, I am on the last scene now and I don't even remember reading it the first time! Seeing how wonderful the tidbits have been, I can't wait to see what is in store for the actual discussion! this is going to be wonderful! Boy. Talk about pressure! I hope we can live up to that. But one thing you can be sure of........the questions won't be easy. I have to agree with you, Nebraska, that the play was much easier the second time around. I am very much looking forward to this discussion. OMG, not newspapers in the coffee house! We've come a long way, haven't we, Starbucks? Our last tidbit for TL... We do have one more treat coming up though so keep checking back! And now we can take our laptops into our coffee house of choice. Amazing!